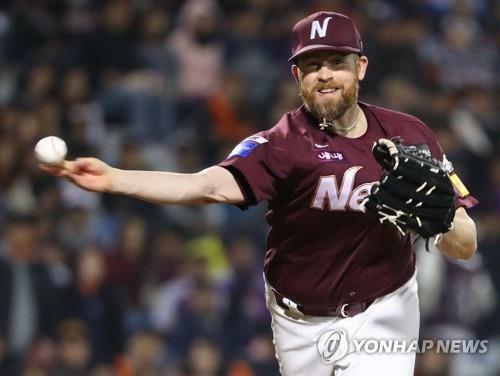 SEOUL, Oct. 23 (Yonhap) — In March, when the Korea Baseball Organization (KBO) season was under way, right-hander Eric Hacker was at his U.S. home, trying to stay up to date on the league where he’d pitched in the previous five seasons and wondering if he’d get another opportunity to play there at age 35. Fast forward to October. Hacker is back in a familiar spot — the KBO postseason. But it has a new twist, as Hacker, formerly of the NC Dinos, is doing so with the Nexen Heroes. Hacker was not re-signed by the Dinos after the end of last season. Hacker had been with the expansion club since Day 1 in 2013 and went 56-34 with a 3.52 ERA in five seasons. He won a league-high 19 games in 2015 and pitched the Dinos to their first Korean Series appearance in 2016. The Dinos went to every postseason from 2014 to 2017, with Hacker serving as a rotation workhorse. But after the Dinos cut ties, none of the nine other clubs sought out the veteran despite his track record — at least not immediately. In the summer, the Heroes came calling, after one of their two foreign starters, Esmil Rogers, came down with a season-ending finger injury. KBO teams can carry up to two import pitchers, and the Heroes decided to fill their vacant spot with Hacker, who’d been openly seeking a second chance in the KBO through his social media postings. Hacker now finds himself in the best-of-five first round series against the Hanwha Eagles, with the Heroes taking a 2-1 series lead into Tuesday’s Game 4. The Dinos also played in the first round series a year ago. They knocked off the Lotte Giants before losing in the next round to the Doosan Bears. In the first round last year, Hacker made two starts and held the Giants to a run in 13 1/3 innings, as the Dinos prevailed in five games. In this year’s first round, Hacker tossed 5 1/3 strong innings in Game 1, giving up one unearned run while striking out seven in the Heroes’ 3-2 win. He will likely start Game 5 on Thursday if the series goes that far.